Note: AnnaFoodTherapy Studio related information already moved to www.AnnaFoodTherapy.com . Thank you. 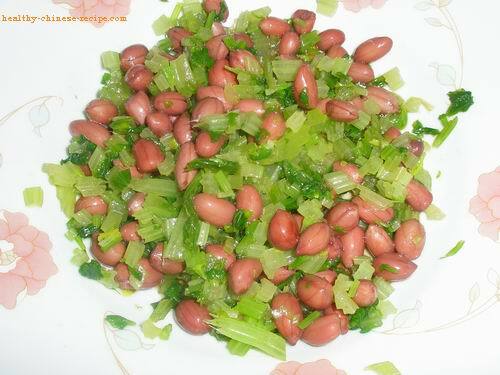 Celery Peanut Salad is a quick easy healthy Chinese vegetarian dish. Celery helps to remove heat in the liver while peanut protects the spleen and the stomach. It's a good snack or side dish for those who are with hypertension (high blood pressure). Actually it fits all most all people. Peanuts have a unique fragrance after boiled. The refresh and crispy celery combining fragrant peanut makes you feel comfortable and satisfied. 1. Wash peanut, add in a pot. Add 3 cups of water in the pot. Add salt and five-spice powder. 2. Bring to a boil, then turn to low heat. Simmer for 40 to 60mins,or till cooked. 3. Wash celery, boil water in a cooker. Add in celery, take out when the color of celery changed. (about 2 to 3mins). 4. Cut boiled celery into very small sections. (about 0.5cm). Arrange in a plate. 5. Take 1/3 cup cooked peanut. Add on the celery section. 6. Mix with rice vinegar, sesame oil, and salt. 1. Boiling peanut takes long time. So you can boil a little more one time. Then serve in several meals. 2. If peanut is salty enough you don't need to add salt when making salad.